There’s a reason people commonly refer to halitosis as “dragon breath”: it’s a beast of an oral health problem that can put off anyone within close range! Mints and mouthwashes can mask the issue, but in order to truly defeat it, you’ll need to treat the underlying cause. If you’ve dealt with morning breath, or struggle with bad breath throughout the day, here are some likely reasons behind it and ways to banish it once and for all. 1. What have I been eating? Not surprisingly, your food choices can have a big impact on your breath. Foods comprised of sulfur compounds in particular — such as garlic or onions — can leave a lingering odor to your breath as they are digested and absorbed into the bloodstream. Coffee is another common culprit tied to bad breath, as it can dry out the mouth and promote the growth of oral bacteria. 2. Are certain habits to blame? If your condition seems more chronic in nature, and you’ve ruled out your diet as a possibility, chances are poor hygiene or habits could be causing your breath to smell bad. Regardless of what you eat, bad breath is sure to follow if you fail to brush and floss regularly. Food particles stuck in hard-to-reach areas will naturally give off an odor as they decompose, as can excess oral bacteria. Smoking is also linked to halitosis, leaving a stale stench on your breath from the smoke particles you inhale and the combustion of chemical compounds. 3. Could it be a side effect of another health condition? Sometimes, bad breath is a side effect of another health issue you may be facing — whether you know about it or not. Acid reflux, bronchitis, pneumonia, diabetes and certain liver and kidney problems are just a few conditions associated with halitosis. Sleeping disorders and/or medications that contribute to dry mouth can also inhibit saliva production essential for a healthy breath. Identifying what’s behind your bad breath situation can help you correct and/or reverse the problem, whether it be through a diet change, habit modification or doctor-prescribed treatment plan. 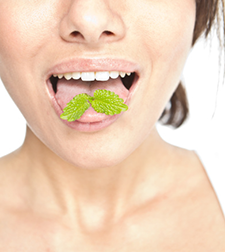 With so many potential causes of bad breath, however, it’s easy for halitosis to re-emerge. Ultimately, the most important step you can take to combat bad breath is to see your dentist on a regular basis. Frequent exams can help prevent halitosis before it starts, and if you do develop bad breath despite your best efforts to avoid it, he or she can help determine the underlying cause. Be sure to ask your dentist for more information about treating and/or preventing halitosis during your next checkup, or schedule a consultation if you have any pressing questions or concerns.